Can Colloidal Silver Help Reduce Acne? Today I will give you the answer! Lately, the use of colloidal silver is one of the hotly debated topics by various medical experts when it comes to treatment of acne. But, is the use of colloidal silver good for acne? Well, being a contentious topic where the health professionals and organizations are taking different stands on the use of the substance, most people are confused on whether to use the colloidal silver or not. Today, we have taken our time and energy to investigate the use of colloidal silver and explored some safe ways that you can use this treatment to cure cysts, scars and pimples. The NCCIH (National Center for Complementary and Integrative Health) defines colloidal silver as a preparation that contains minute silver particles that are suspended in purified water. The colloidal silver is also referred as electro-colloidal silver. This product is said to contain a broad spectrum of antimicrobial action. This product features several properties including antifungal, antiviral, and antibacterial properties. We also learned that this product was being used as an antibiotic before penicillin was Discovered. The Hopinforhealth organization claims that the military carries this substance on the battlefield even today to treat the wounded soldiers. Besides the antibiotic use, this product is currently being used in alternative medicine as a cure for a sore throat, acne, diabetes, gastrointestinal, food poisoning ear infections, as well as shingles. Acne is a common skin condition that affects all individuals regardless of their age or gender. Everyone would wish to have smooth and youthful skin. However, many factors make our skin to look old and tired. One of these conditions is acne. This condition develops when our skin pores are blocked by sebum. Sebum is simply the oil that the sebaceous glands produce to keep the hair and skin healthy. However, as with everything else, too much of something is considered dangerous. When the body produces too much of this oil. It may block the skin pores. When there is an outbreak of acne, the side of the follicles sticks together. This will reduce the amount of sebum that reaches the skin surface. When this happens, the trapped sebum will react with oxygen resulting in a dark brown blackhead. Since more sebum is trying to push through to the skin, it builds up the pressure, and this causes the follicle to collapse, forming pus-filled cyst. 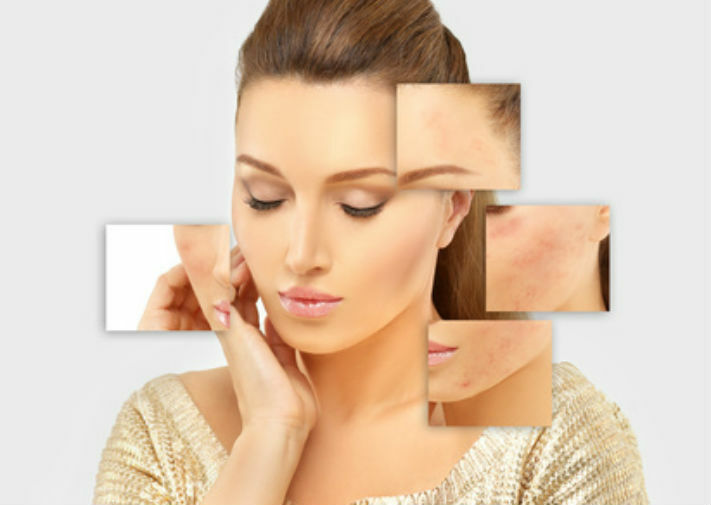 Besides the above cause of acne, other various factors contribute to the formation of acne. These include things such as hormones that develop during puberty, use of oil-based cosmetics as well as greasy hair. Hereditary factors also play a major role so if your parents suffer from this condition; you are also likely to get it too. Skin irritation especially when cleansing or due to chinstrap, pressure may also contribute to acne. Another factor that contributes to this condition is pollution and living in areas with high humidity. Research also links diet to development of acne although there is no study that has provided a true link between acne and food. So, what are the benefits of colloidal silver in healing acne? As mentioned earlier. The colloidal silver has various properties that allow it to heal various skin conditions including acne. Let us look at some of the ways that your skin can benefit from the use of colloidal silver. When the skin pore clogs, there is the formation of skin bumps referred as blackheads and whiteheads. We also have Propionibacterium acnes, which is nontoxic skin bacteria that leads to skin inflammation or redness. If these bacteria are not taken care of, the condition can result in acne pimples (pustules) and cysts, which are painful. Basing our argument on traditional Chinese medicine (TMC) organization, applying the Colloidal Silver to the affected area assists in treating the acne. As mentioned earlier, the colloidal silver has potent antibacterial properties that will kill the bacteria that cause the acne. According to this TMC organization, this product will not only clear the acne pimples on the skin but also goes for an extra mile to prevent the development of new ones. The colloidal silver also plays a significant role in reducing the redness and inflammation caused by bacterial infection. This will clear the acne and promote the healing of the acne scars. Is Colloidal Silver Safe for Treating Acne? Taking the colloidal silver is highly controversial. We have some books and alternative medicine sites that say that you can use the colloidal silver both orally and topically. However, the NCCIH claims that silver doesn’t have any proven benefits(1) to the body when ingested. Mayo Clinic also shares this thought and adds that silver isn’t a necessary nutrient and it’s not safe to take orally(2). Nevertheless, the manufacturer of the colloidal silver argues that there is no adequate evidence that can support these claims. Basing their arguments on the above finding, the FDA has recently given judgment against the sale of the nonprescription colloidal silver for treating medical problems. In its place, this body has suggested labeling of the silver products as dietary supplement. This might also be the reason why colloidal silver isn’t listed in E.U. approved food list and UK drug guides. On the other hand, we still have a broad anecdotal evidence that supports the use of this product. According to the NCCIH, the colloidal silver has various benefits to the skin when used topically. The TMC organization claims that the product assists in treating skin infection and burns when used in dressings and bandages. Additionally, the there are positive results in treating conjunctivitis when the colloidal silver is used in newborn babies. Similarly, the Traditional Chinese Medicine Organization also states that the colloidal silver can treat acne. The treatment if you use to apply on the affected area. Bottom Line, Read the Information and make up your own mind. If in doubt ask your Doctor. Looking at all the arguments presented by various health organization, we concluded that the best way to use this product is through topical application. Below are some of the ways that you can use the colloidal silver safely to help get rid of the acne cysts and pimples. Take a spray bottle and fill it with colloidal silver. Spray the affected areas at least twice a day. Make use of colloidal silver ointment or gel on the affected area and allow it to settle overnight before rinsing. One of the advantages of using the ointments and gels is that they are thicker and more active. However, you should avoid using them regularly as it could lead to conditions such as argyria (you can read more on argyria below) . Opt for colloidal silver soaps on a daily basis as a cleanser to help cure acne and minimize scars appearance. As mentioned earlier, overuse of colloidal silver leads to unpleasant side effects such as skin discoloration. For this reason, it is important to know the right dosage to avoid overuse. Note colloidal silver concentration usually varies depending on the manufacturer. However, you will find the most product with ten parts per million (PPM) concentration. If you are using a colloidal silver product that has 10ppm, medical experts recommend use of 50-60ml in the first days then reducing the amounts to about 20-30ml daily. This way you can treat most problems conditions associated with acne without causing silver buildup. It is good to remember; there is manufacturer that recommends oral intake of this product. However, according to our research, most of the reputable organizations that regulate drug use discourages oral intake of colloidal silver. For this reason, we strongly warn the users against oral intake and recommend the topical application. You should also remember to stick to products with 10ppm and no more than 50ml daily. For the best results, apply twice per day, meaning 25ml in the morning and 25ml evening. Where Should I Buy Colloidal Silver? Being a natural supplement, you can find colloidal silver in most food stores. It is also possible for you to prepare it in the comfort of your home although you need to have a gadget we refer to a colloidal silver generator. If you find these options not working for you, you can also purchase it on Amazon. Caution; before you can purchase this product from Amazon, ensure that the seller is reliable. Reading the customer reviews will help you know whether the previous customers were satisfied with the product they got. After Clearing the Acne, How Do I Keep My Skin Healthy? As you can see, the colloidal silver can help you clear the acne. However, due to the causes we mentioned earlier, the condition can reoccur. Below are some of the ways that help you keep your skin acne free. Drink lots of water- keeping your body well hydrated enables your skin to flush out toxins and waste that leads to acne development. Ensure proper skin moisturizing and cleansing- cleansing the skin regularly will remove the excess dirt and oils that may clog your skin pores. If your skin needs additional moisturizing use a “noncomedogenic” moisturizer-, using heavy moisturizer may lead to clogging of more spores. Using a noncomedogenic moisturizer is essential is preventing acne outbreak. As you can see, the colloidal silver has backing from one of the renowned health bodies in the world. For this reason, it is safe to say that you can use it to treat acne. However, before you can use a product, there are some side effects that you need to be aware of. Argyria is the most pronounced side effect when it comes to the use of colloidal silver. This is a statement from the NCCIH. This organization states that the use of the product leads to argyria, which is a condition that leads to bluish gray skin discoloration caused by excessive use of this product. Overuse of this product leads to accumulation of silver in nails, skin eyes, gums and other organs. While this might not be a health concern, the argyria is a serious beauty concern as it might increase the distress that is already caused by acne. We also have some studies that show that long-term use of the Colloidal silver could also lead to obstruction in the absorption of various medications including thyroxin, tetracycline, quinolone, and penicillamine. However, some authorities believe that there’s No Proof Colloidal Silver Interferes With Drug Absorption(3). In addition, although this is rare, use of colloidal silver may also lead to seizures and kidney damage especially when used in excessive doses. Last few words. Acne is a condition that everyone would want to avoid. Having beautiful skin helps us to feel good about ourselves. However, sometimes it is hard to maintain a youthful and healthy skin because of our diet choice, pollution, weather condition, and grooming issues. Nevertheless, you don’t need to shy away from your friends just because you have a rough skin. Making use of the colloidal silver will help you get the smooth skin you have always wanted. Just remember to use topically and follow the dosage we have recommended!